Willis "Nomo" Humphrey, while working on 'Remembering a Forgotten Hero,' a tribute to Octavius V. Catto. Philadelphia has a rich African American history, one that’s evolving to this day. These Black History Month events provide distinct opportunities to experience that cultural inheritance — from the story of Civil War-era civil rights crusader Octavius Catto to the rhythms of African drum and dance ensemble Kulu Mele. Whether you choose to explore on foot, by trolley, or even through trivia, this list offers something for everyone. Octavius Catto was one of the most significant figures in Philadelphia’s civil rights history — so significant, in fact, that he was the subject of the city’s first public statue honoring a specific African American, unveiled on the south side of City Hall in 2017. At this book discussion, Tasting Freedom authors Daniel R. Biddle and Murray Dubin, both former Inquirer journalists, talk about highlights of Catto’s life, including when he shared the stage with Frederick Douglass, played on the city’s best black baseball team, taught at the Institute for Colored Youth, and advocated in the streets and the state capital for equal rights. The Independence Seaport Museum hosts this discussion of African American women’s fight for freedom and equal rights in conjunction with Center City’s Moonstone Arts Center. Panelists include Temple religion professor Nyasha Junior and Ursinus English professor and African American studies coordinator M. Nzadi Keita. A monthly meetup, the Black Herstory Mixer brings together professionals for a celebration focused on empowering women. Look forward to a female-driven panel discussion, performances, and a pop-up shop with local lady vendors. Attendees will have an opportunity to connect with each other during a speed networking session. 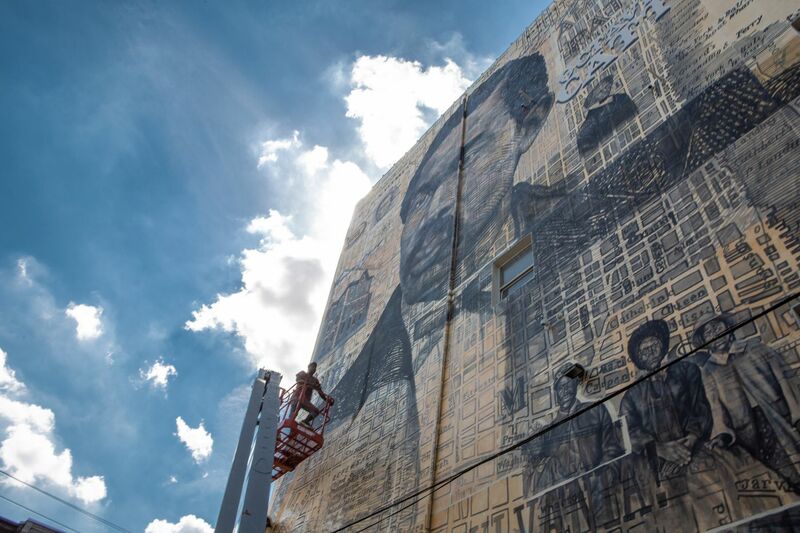 Hop aboard for a two-hour trolley tour that will take riders to various neighborhoods to see murals that depict important African Americans in both the city’s and the nation’s history. Guides will explain each mural and the process of creating them while also touching on topics like civil rights, freedom, and equality. Amble through West Laurel Hill Cemetery to learn about the lives of black pioneers, civic leaders, and entertainers who influenced Philadelphia and beyond. A guide will discuss the significance of figures such as R & B legend Teddy Pendergrass and civil rights leaders Sadie Tanner Mossell Alexander, the first black woman to graduate from Penn Law School. This dramatic performance is all about wemilere, a celebration of deities (orishas) in the Yoruba religion and culture, which has spread from Nigeria and Benin to the United States, United Kingdom, Cuba, and several Caribbean nations. African drum and dance ensemble Kulu Mele will kick off the event — part of the African American Museum’s celebration of the African diaspora in Philly — followed by a documentary short screening and a Q&A. Explore the little-known stories of Philadelphia’s African American community from the 18th century through today at this edition of Museum of the American Revolution’s series History After Hours. Terry Buckalew from the Bethel Burying Ground Project will showcase his research on the 19th-century African American burial ground in Queen Village. At 6 p.m., former Philadelphia Inquirer reporter Sofiya Ballin will discuss her identity series Black History Untold, which explores the black experience through personal essays (and earned her the National Association of Black Journalist Award in 2017). Admission includes full access to the museum. Former Philadelphia Inquirer reporter and storyteller Sofiya Ballin will discuss her award-winning series 'Black History Untold' at the Museum of the American Revolution's History After Hours event on Feb. 19, 2019. Student performances anchor this Black History Month celebration, organized by the Mann Center for the Performing Arts and hosted at the Philadelphia High School for Creative and Performing Arts. Performing groups include the Gesu School’s gospel choir, Sister Cities Girlchoir, and CAPA’s own choir, jazz band, and dancers. The Mann Center will also honor four educators who have greatly affected the lives of Philly students at the celebration. Put your study skills to the test — and contribute to a good cause — at the Franklin Institute’s first Black History Challenge, a fund-raiser for the museum’s youth leadership program, Partnerships for Achieving Careers in Technology and Science. Teams receive the questions when they register and can prepare in advance. The five-round competition will be hosted during the Franklin’s community night, when admission is free for all visitors after 5 p.m.
Sisters in Freedom tells the Philadelphia-centered story of the brave black and white women — including Lucretia Mott, Sarah Mapps Douglass, Harriet Forten Purvis, and Angelina and Sarah Grimké — who created America’s first organized female political force to end slavery before abolition. Settle in for a screening of the award-winning documentary, which premiered in September, followed by a panel discussion curated by Nathaniel Popkin, the film’s writer.